First dates are nerve wracking for everyone. What do you wear? What do you say or not say? But, honestly, the uncertainty and nerves make it exciting! To avoid becoming too nervous, though, and botch the whole thing, take some advice from us to make this date go as smoothly as possible. First, and probably most importantly for girls, is to figure out how much time you think you’re going to need to get ready for your date — then add an extra half hour. This way you aren’t rushing and you have time to handle any hair or wardrobe emergencies that may come up. You don’t want to be extra nervous or frazzled before he even picks you up! Even out your complexion with a concealer and a foundation or tinted moisturizer that blends into your skin’s natural tone. Pick either your eyes or lips to accentuate, but avoid dark colors for eyeshadow or lip color. A neutral smoky eye based in browns or muted purples is a good choice, but avoid too much eyeliner or any black shadow. A red, coral or pink lip is pretty, but keep eyemakeup tame if going for this look. Make your cheeks pop with a bit of peachy blush, but keep it toned down if you are doing a strong eye or lip. Add a bit of shimmery white shadow at the inner corners of your eyes, blending well, to open and brighten your eyes. This little trick will have his eyes locked on yours all night. If you aren’t comfortable on your date, you won’t be acting like yourself, worrying more about your top falling down or tripping over your heels than what he got his degree in or what is favorite band is. If you fidget every time you wear a skirt or never wear heels for fear of breaking your ankles, now is not the time to try them out. Dressing for the occasion is also extremely important. You want to dress to impress wherever you go, but if you are hiking at the state park, don’t pile on accessories; if you are eating at a five-star restaurant, don’t wear jeans. Use common sense, and you will feel much more comfortable in your environment. Finally, you want to dress to flatter your figure but still leave him guessing. Showing a tiny bit of cleavage, bordered with a sophisticated blazer or sporting a hip-hugging pair of pants with a pretty flowing top will show him what you’re made of, but also leave the rest a mystery — prompting a second date! A first date is a chance for the two of you to get to know each other to decide if you want to pursue things further. If you are putting on an act to impress him, he won’t get to know the real you. This seems like common sense, but you might be surprised by what you are willing to fake just to get him to smile at you. If you’re quirky, be quirky; show your sense of humor. Tell him about your interests — your real interests, not the ones you put on job applications because you want to seem cultured and intelligent. If he ends up not liking the real you, that’s okay. It just wasn’t meant to be. It can be easy to rattle on about yourself on a first date, especially if you are nervous. Avoid making this about your life story, and be sure to ask him questions and give him a chance to open up. On the flip side, be courteous of his boundaries, as you two are just getting to know of you. This includes not giving him every detail of your life, but also not grilling him on his like it’s an FBI background check. In this modern age, the question of who pays for the bill can be a tricky one. If you asked him out, offer to pay the entire bill, but expect him to offer to chip in or even insist on getting the entire bill. But if he doesn’t, be prepared to fork over the cash. If he asked you out, you should still offer to pay your half, although he will probably take care of the bill this first time around. If he doesn’t, remember that you offered to pitch in (he may think you are uncomfortable letting him pay), so pay up and don’t get upset. If has already made it clear that he is paying and you are worried about what to order, simply ask him what he is thinking about ordering, then choose a dish of similar value. 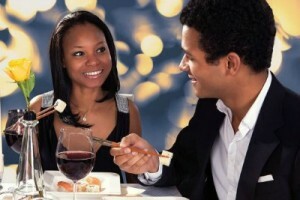 He might be willing to spend on this first date, but don’t take advantage of the guy! Usually by the end of the date, you will both have some sort of idea of if you want to see each other again. Hopefully the feeling, whatever it is, is mutual. If things went exceptionally well, you could drop hints that you are up for another date in the near future. Perhaps suggest an outing based on something you discussed earlier. If things clicked really well between the two of you, then a kiss may be in the forecast. If you’re comfortable, go for it! If you don’t plan to kiss on the first date, though, don’t give him the opportunity to (no lingering in his car or fiddling with your keys at the front door — he may take this as a sign to pucker up). Initiate a lingering hug (so he still knows you’re interested), and maybe give him a peck on the cheek, letting him know you are looking forward to the next time you see him. Put yourself in control of the situation, and the iffy grey area of a goodnight kiss won’t be so awkward.